In recent years, the Rohingyan people have endured an endless stream of violence. There have been unwarranted and unlawful killings and abuse, houses have been destroyed, and entire communities wiped out. The Rohingyan people have had no choice but to flee to safety, leaving their homes and lives behind; families have been torn apart through no fault of their own. The results are absolutely devastating to witness, and for those affected, their lives have changed forever. 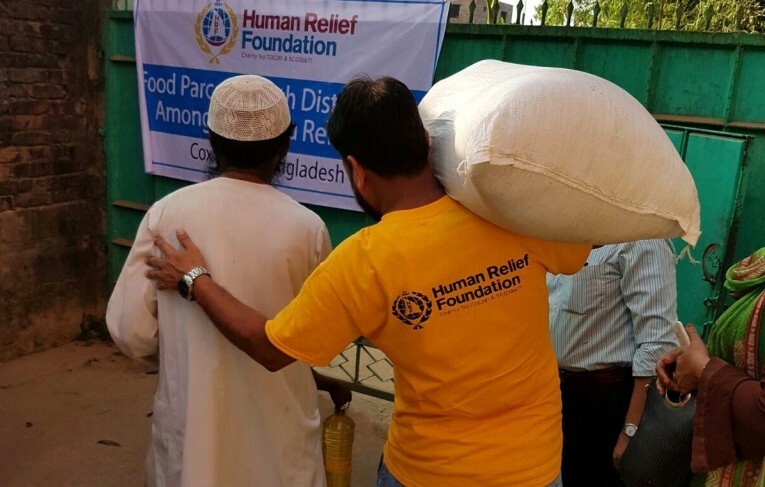 The Human Relief Foundation relief team are out in Bangladesh right now, delivering aid where it is needed most – directly to the Rohingyan people. These vital care packages are in high demand and can feed a family for weeks. There is still much more to be done, and we need your help. With up to half a million Rohingyan people affected by the ongoing crises, there are still many more families that are desperately hungry and in need of our care. How long could you survive without adequate food or water? Could you deal with the affects of dehydration and starvation? The impact that hunger has on these poor refugees lives is dramatic, but, with your help, we can provide them with the food they need to survive. Cause and Effect: How did this Happen? The Rohingya have been described as some of the world’s most persecuted people. They are known as being ‘stateless’ because of the way the Myanmar government refuses to recognise them as part of the country’s ethnic groups. This means that they not only lack legal protection, but they are regarded as refugees and face strong hostility wherever they go. Many Rohingya people have been fleeing Myanmar in an attempt to escape the torment they have suffered. Many families have taken refuge in other countries and states in south-east Asia; but many more are still on the road with little more to their name than the clothes on their backs. Rohingya refugee families have to cope with crippling hunger, malnourishment, dehydration and homelessness on a daily basis – not to mention the mental suffering caused by such huge losses in their everyday lives. You can donate to our Relief for Rohingyas campaign and support our ongoing goal of providing as many Rohingya refugees with essential supplies as possible. Your donations will deliver much-needed food and care packages to those desperately in need of our help, giving them the necessary means to survive. With your generous support, we have already been able to provide many Rohingya families with vital food packs. However, the crisis is showing no signs of slowing down, and many more vulnerable people still need our assistance. Please donate anything you can to allow us to send aid to as many people as possible. The ongoing Rohingya crisis has resulted in the persecution and displacement of many Rohingya people, leaving these refugee families without food, shelter and essential supplies. Please donate today to help us send vital food packages to those most in need. For further updates on the campaign, please follow us on Facebook or Twitter.